When my now 28 year old son was a wee lad, he loved penguins. I didn’t crochet in those days. I found a cute little stuffed animal, brand new, at a thrift store. Around his neck was a jaunty yellow scarf with the word Swanson on it. Seems that this particular penguin had been an advertising giveaway for Swanson frozen foods. 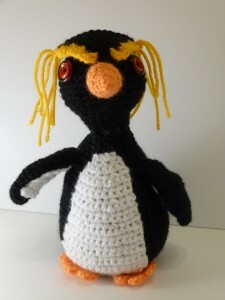 Since my son could not yet read, I named the penguin, rather creatively, Swanson. And, Swanson still resides on the top bunk of my son’s old bed – one of the many collectibles I need to bag up and pass on to my son, now in his own (teeny) house. I love this ,It is so cute and has a great expression on it. Made me laugh .Thank you!